Summary: The village of La Paz is a very noisy place until the people, wanting some peace and quiet, fire the mayor. The new mayor, Don Pepe, brings in peace and quiet all right, but his ban on singing makes the village as quiet as a tomb. One day a rooster comes to town with his family, and at dawn delivers a loud, “Kee-kee-ree-kee!” Don Pepe tries everything he can to shut up the rooster–putting him in jail, cutting off his food, and eventually threatening to kill him–but the rooster continues his song. “A song is louder than one noisy little rooster and stronger than one bully of a mayor,” says the rooster, “and it will never die–as long as there is someone to sing it.” The inspired townspeople burst into song, Don Pepe skulks out of town, and La Paz is a noisy, lively village once again. 48 pages; ages 4-8. Pros: A timely message in today’s world, celebrating those who will not be shut down by bullies. Kids will enjoy the colorful rooster and exaggerated evil-villain characteristics of Don Pepe. 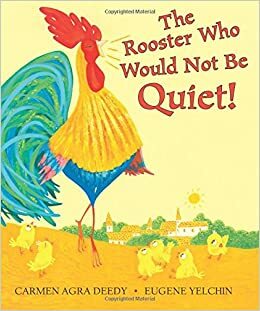 Cons: While I’ve seen this book on a few Caldecott lists, I found the illustrations a mixed bag; I liked the portrayals of the rooster and Don Pepe, but not so much the ones of the townspeople.